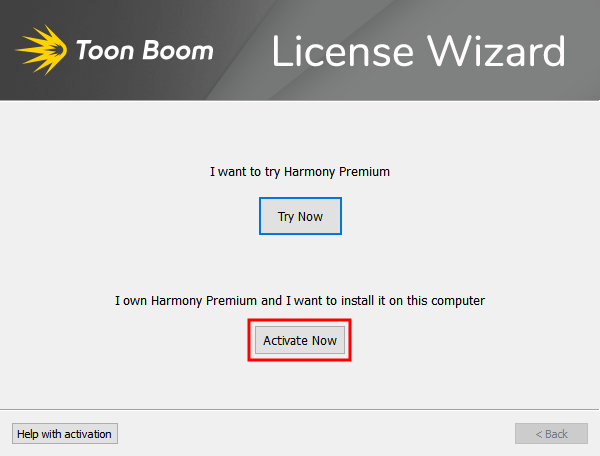 If you have purchased a desktop subscription for a Toon Boom product from the Toon Boom website, you can activate your product by launching it, then signing in to your Toon Boom account from the activation prompt. The following steps require a direct connection to the Internet. Make sure that you are not connected to a proxy and that your firewall or network is not configured to block access to the Internet. If you need to activate your product on a machine that has no Internet access, you can do so by obtaining your product code from the My Downloads section of your Toon Boom account, then activating this product code via email—see Activating a Local License via Email. NOTE: You can also launch the License Wizard directly—see Starting the License Wizard. The Activation Successful screen appears. It confirms the product you activated.